It’s not everyday that you find yourself purchasing new carpet so take it from a carpet cleaner, there’s a lot more to consider than simply cost. As the leading carpet cleaner in El Dorado County, we see many types of carpet on a daily basis. We know what holds up to heavy traffic, pet accidents, and the infamous “red dirt” in our area. Consider the retailer, the fiber and the pad. What your carpet is made from and its installation will have a significant effect on how it looks a year from now, and in years to come. 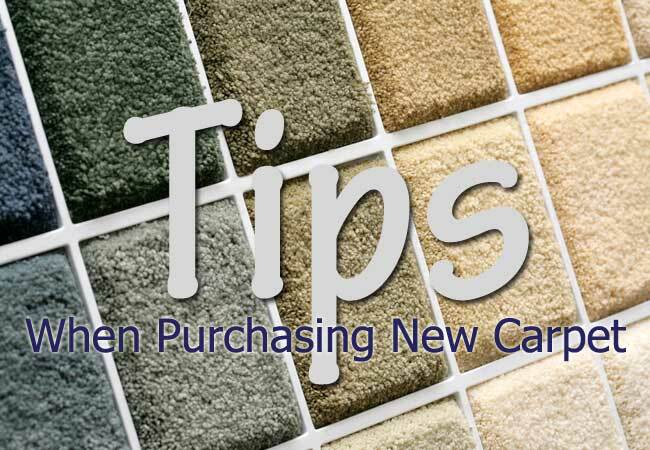 As tempting as it seems, avoid the big box store when purchasing new carpet. They typically lure customers in with very low prices or free installation but there’s a catch. Big box stores don’t always sell a quality carpet or use the finest carpet installers, which will result in problems down the road. Stick with a smaller, local carpet retailer if possible because you’ll likely get a more informed salesperson and a qualified installer. Opt for a 100% nylon fiber when purchasing new carpet. There are other synthetic carpet fibers, like olefin and polyester, but they don’t hold up to wear like nylon does. These cheaper synthetic carpets often end up with an irreversible “matted” look in a short period of time. Keep in mind that regular carpet cleaning will remove soil, but it doesn’t reverse wear. Obviously, there are many factors to consider when making a new carpet purchase. If you’re looking for a lifetime, highest quality carpet you may want to look at a natural fiber carpet made of wool. If you own or manage some rental properties and know the carpet will be replaced every few years, the cheaper synthetics may be a better option for you. Generally speaking, 100% nylon carpet is a good balance between cost and quality. Choose a 7 or 8 pound carpet pad to support your new carpet. Carpet pad is literally just that, the support system. A 8 pound pad may feel a bit stiff but it will hold up to traffic and extend the life of your carpet. If you choose something too soft, like 6 pound, it will breakdown prematurely and your carpet won’t be supported properly. In this type of situation, the carpet begins to fail shortly after the pad and you’ll end up replacing them again. You’re best to select a carpet that feels soft, not the carpet padding. Be sure to read this post if you are curious about Pet Proof Carpet Pad. Carpet is a big purchase. Do your homework by researching the carpet retailer you intend to work with. Choose a quality nylon carpet and be sure to invest in a good pad. Then stretch out and enjoy your new carpet for years to come!